I am so excited to share this recipe for gluten-free gulab jamun with you guys! You won’t believe what these are made out of… COCONUT FLOUR! Yup, these are coconut flour gulab jamuns! If you’ve ever been to an Indian restaurant, you’ve probably wondered: are gulab jamun gluten-free? No, they’re not. They are traditionally made with milk powder and flour. Well, this famous Indian dessert is getting a paleo makeover! 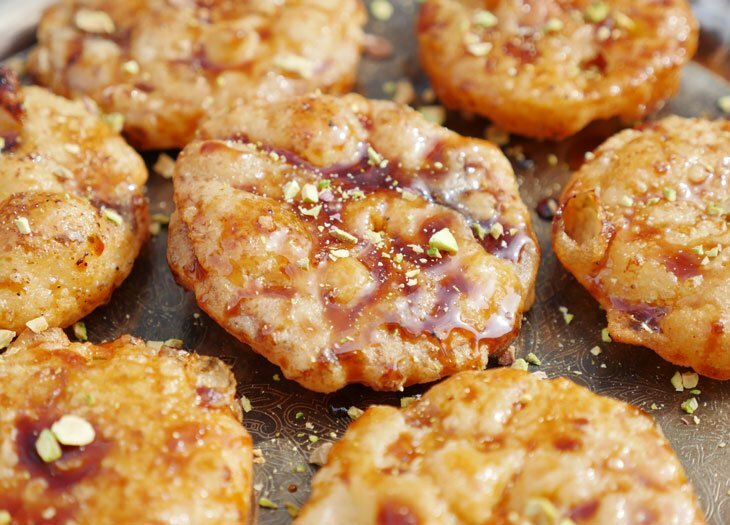 Think: sweet fried dense donut-like dumplings soaked in an aromatic sweet syrup! Those of us who have to be gluten-free or who would just prefer a cleaner version of this dessert can enjoy gulab jamun once again! 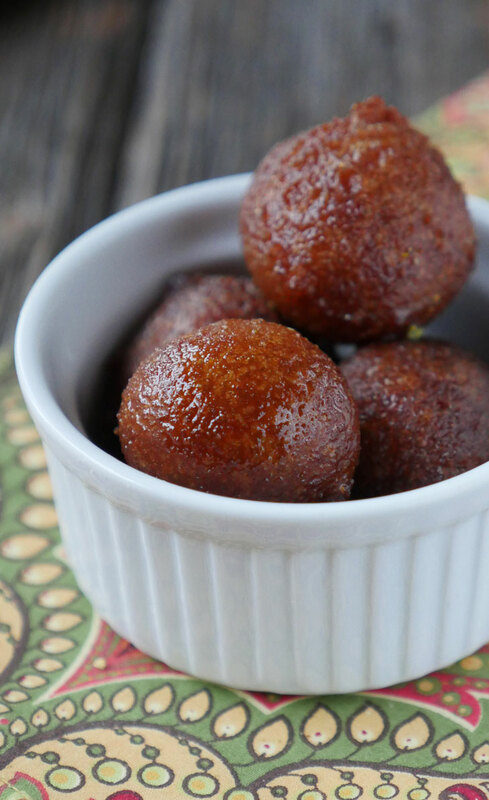 Not only are these gulab jamuns gluten-free, they are PALEO-friendly too! That’s right this is a Paleo Gulab Jamun recipe! That means they are dairy-free and grain-free. My recipe is also nut-free! So many exclamation marks – can you tell I’m excited?! 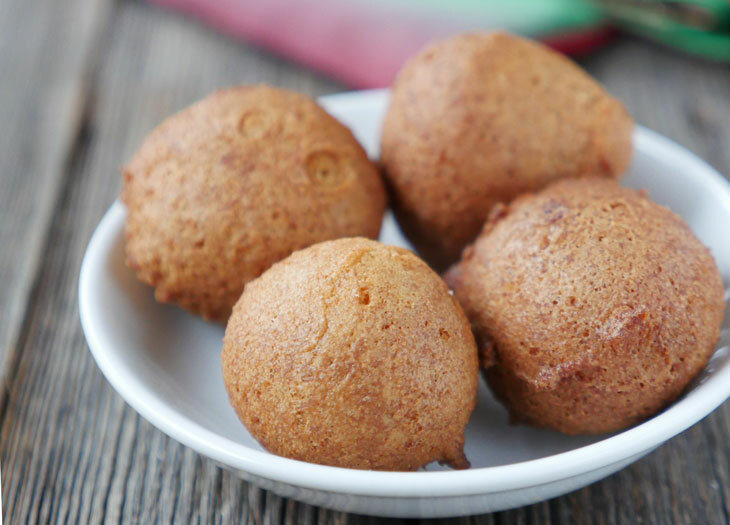 I know a lot of paleo desserts call for nuts but these heavenly little deep-fried balls of sweetness are made with coconut flour! I know coconut flour gulab jamun may not seem decadent but trust me, they are. Yes, this dessert is a bit healthier than regular gulab jamuns BUT it’s still very rich and decadent. You are going to absolutely love this recipe. I came up with this recipe for gulab jamun several years ago when I was following a strict paleo diet. Those of you who have my eBook, South Asian Persuasion: 100+ Paleo Indian Recipes, have had this recipe for awhile now. I figured it was about time that I share it on my blog – I know many of you still follow a paleo diet or would prefer a cleaner version of this classic Indian dessert. Plus, Holi (an Indian festival) is coming up so what better time to make these! 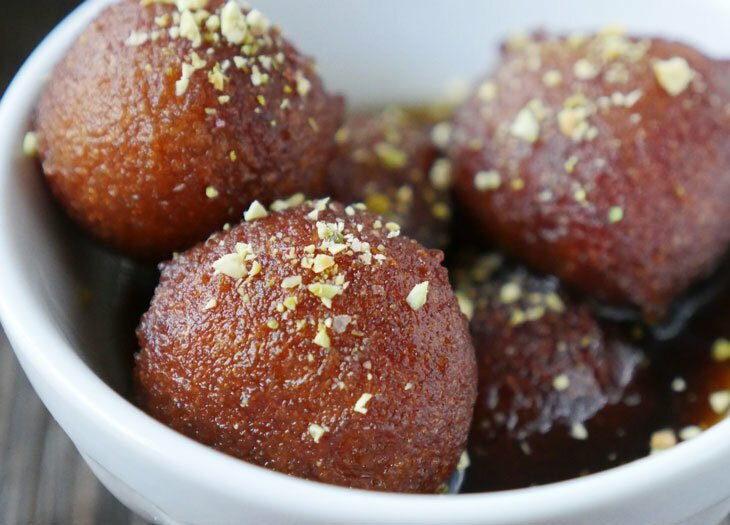 In my ebook, I have two recipes for gulab jamun: an almond flour gulab jamun and a coconut flour gulab jamun. Today I’m sharing my recipe for coconut flour gulab jamun! 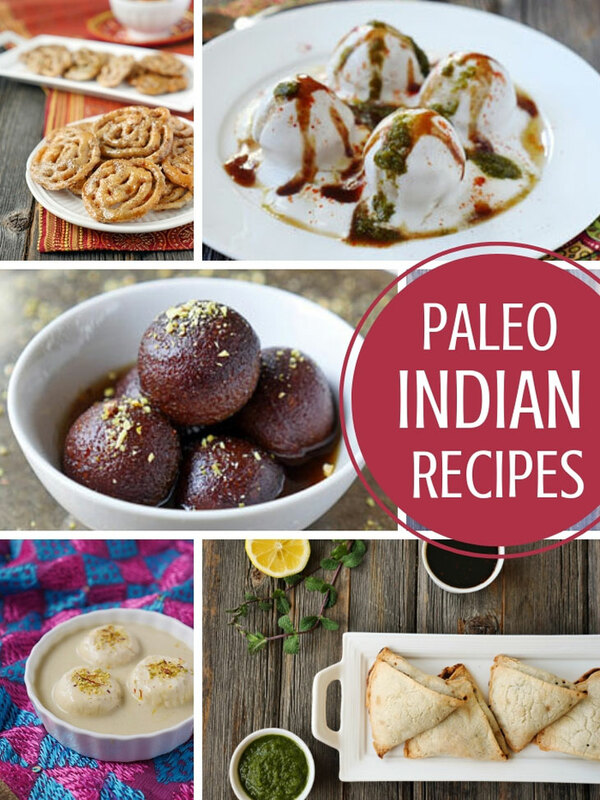 I hope you’ll check out my eBook for other gluten-free, grain-free, paleo-friendly Indian recipes! 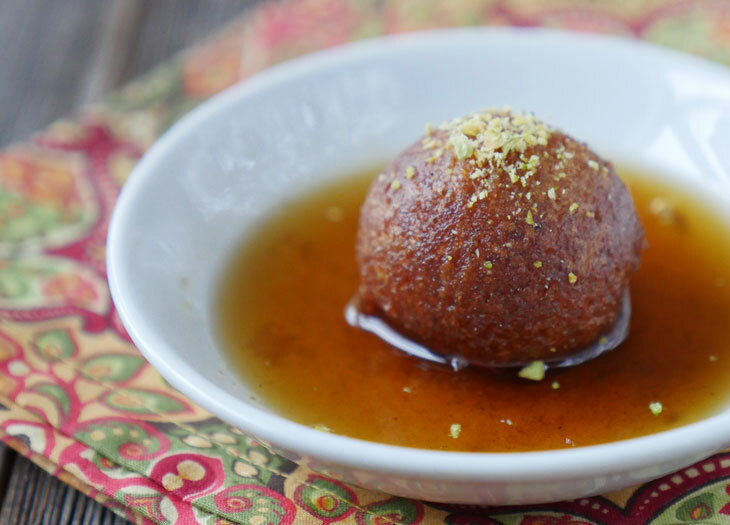 Gulab jamun is a sweet dumpling soaked in a rose and cardamom flavored sugar syrup. This dessert is served during weddings, holidays and other celebrations! There are so many Indian desserts that exist (we tend to like sweets! ), but to me, gulab jamun is the quintessential Indian sweet. You can find this dessert at nearly every Indian restaurant and it’s almost always served during a special Indian occasion. I absolutely love gulab jamun and so several years ago, when I found out that I had to start eating a gluten-free diet, I was pretty devastated about the fact that I’d never eat a gulab jamun again. That’s because this sweet is traditionally made with flour as well as an ingredient called khoya which is a milk product. Holi, a spring festival known as the festival of colors, is just days away so I figured this would be a great time to share this recipe. 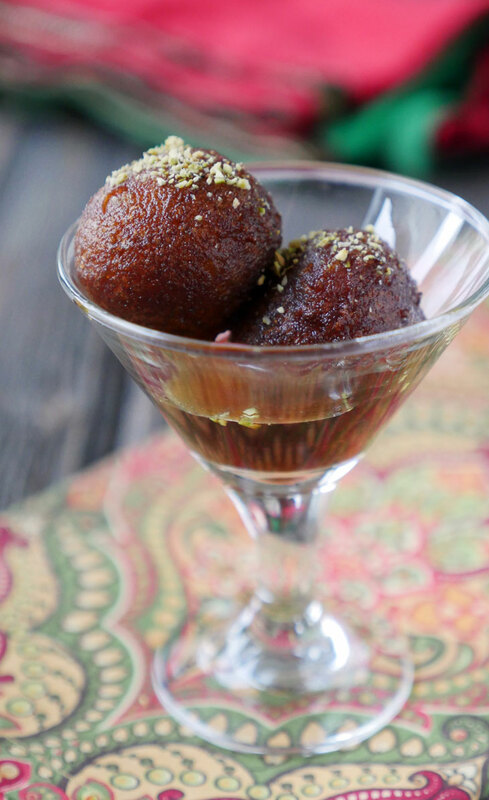 Make these gulab jamuns along with thandai, a popular Holi drink. After what has seemed like a very long winter, I am ready to celebrate spring! I’m excited about longer sunny days and spending more time outdoors with my kiddo. I’m also excited about making and eating these gulab jamun – I can’t wait to hear what you think of them! While you wait for the oil to get hot, combine the arrowroot flour, coconut flour, coconut sugar and baking soda to a bowl and mix well. Then, add the eggs and coconut milk and mix well. When the oil is hot, use a small cookie scoop and drop the dough into the oil. When one side of the donut becomes golden, flip it over and cook the other side for about 3 minutes, or until golden. Fry 3–4 donuts at a time. Place the fried donuts onto a paper–towel–lined plate. Add all of the syrup ingredients to a saucepan over low–medium heat and cook for 5–8 minutes. Turn off the heat, add the donuts to the saucepan and allow them to soak in the syrup for 5-10 minutes. Garnish with crushed pistachios if desired and serve warm. Can these be done in an air fryer? Hi Catherine, this recipe won’t work in an air fryer because it isn’t a dough – it’s a batter that forms its ball-like shape when you fry it in oil. It’s a bit different due to the coconut flour. It’s delicious though so I hope you give it a try! Ahhh I’m so excited to try this!!! Nope, in my opinion they aren’t eggy at all. They’re more like a cake/donut that tastes like gulab jamun 🙂 Let me know what you think if you try them! Kate, that is awesome lol! I came up with these years ago and am just now publishing some of my ebook recipes on my blog! Please let me know what you think of the gulab jamun when you try it!! Made today everyone loved it!! Hey! Celiac here who is Lactose Intolerant. What about a recipe for Mutter Paneer that’s Gf and And Lactose Intollerant? Hey Brandon! I actually have that on the blog! Here’s a link https://myheartbeets.com/mattar-paneer/ It calls for dairy-free paneer – a recipe that’s in my Paleo Indian eBook South Asian Persuasion. Can you use corn starch instead of arrowroot flour? I haven’t tried this with corn starch, but if you do please let us know how it goes! Are these as “light” as indian gulab jamun? Or are they more dense like donuts? Can we use xanthan gum instead of arrowroot? I don’t think arrowroot is allowed in keto. This recipe was good! I just made these tonight, and I liked them. I was a little skeptical because I thought these might end up tasting like coconut, but I used raw milk and cream instead of coconut milk since that is what I had, and I was pleasantly surprised. I will definitely make these again, but i will cut the baking soda next time, because I could taste it a little when I was eating them, but I do think that my palate might be a bit sensitive to baking soda, so it could just be me. But thanks for the recipe! I appreciate you making Indian cooking accessible to the American (and dietary restricted) cook! I’m really happy to hear that you liked the gulab jamun! Thanks for letting me know how it turned out for you! Hi . Just made these, mine didnt soak up the syrup that well. Is the syrup thick or thin? But it’s definetly great!! I’m glad you like them!! Try letting them soak longer – the coconut flour in the gulab jamun is great at soaking up liquid so if you give it a bit of time it should soak it right up! I’d say the syrup is thin but if you prefer thick you can reduce it on the stovetop 🙂 I hope that helps!